You might have seen many blogs that they place ads and other widgets above the header section or below the header section of a blog post. 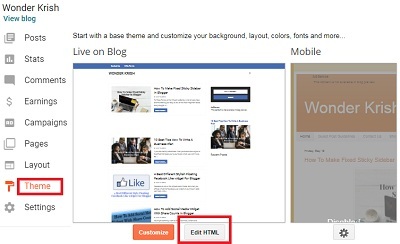 Unfortunately, being a Blogger user we do not always have the option available to add a widget above and below the header section and the Blogger’s default templates or any other third party templates that you have downloaded or purchased. So, how do you add a gadget above and below the header of a blog post? You might like to add your AdSense ads, a search bar, social share buttons, or many are a simple widget of your choice? But don’t get discouraged, today this tutorial would teach how to add widget section above and below the header section of your blog post. I have made this tutorial as simple as possible and have discovered a simple way to add a widget section above and below the blog post section. Just follow only the 4 simple steps and you will be done in no time. Step 2. Pressing Control + F together search class='main' id='main' . You will find similar code as below. Step 3. Now, replace the above code with the below code. You can just make changes as your desire by changing the values, but you have to be a little careful while changing the values. maxwidgets='5' - Change or increase the number as you desire to add a number of widgets. Step 4. Click on Save to save your settings and check out the changes you have made in ’Layout’. You will notice that a new Add a Gadget section has been added to your post body section. Enjoy! or leave a comment below if you have found any difficulties in adding the codes, or if it did not work on your blog.